Discover: Lands Unknown took the bgg hotness by storm a few months ago and I'm pleased to review this game. This will quite a strange review as it will be impossible to review it without some minor spoilers - reader beware. Also, the nearly-unique selling point of this game is that every box, or at least the components within it are unique to that copy. My game will have a different mix of cards, terrain, explorers than any other Discover game. I find that individuality quite compelling. Each game comes with 2 different terrain types, I had the Badlands and the Island terrain types and 12 different characters, out of a possible 36, each with their own strength and weaknesses. Items, monsters and even the storyline are also variable between boxes. I shudder to think what steps were taken to try to balance the number of different possibilities. If you're curious to see the contents of my game then you can watch my unboxing video (~9 mins). The scenarios start with your characters waking up at a campfire of an unfamiliar land. Each particular terrain will have a different counter-mix and different cards. The placement of terrain is also randomised so if you're replaying a scenario and are trying to find a particular landmark and advance the story it will most likely not be in the same location. The game itself felt well balanced. you cannot just go for broke and fight every single monster or just search out landmark features. You'll need to care for your survivor making sure they've got adequate supplies of food, water and resources from which you can make useful items. If you're not careful then you'll likely take damage quickly and you will lose the game which will happen after you've taken 4 damage. If your survivor is eliminated the remaining players keep trying to beat the game so you best have something to do whilst you wait. A turn consists of a day and a night phase. During the day phase, you'll take actions up to your stamina limit or whenever you decide to stop. Most actions cost 1 stamina and there are 10 different actions available to you. Each night you'll recover some stamina so that you can function again the next day. However, as you'd expect, during the night phase your survivors have to deal with some threats. Whilst trying to survive you're trying to meet scenario objectives or 'stages', these are sequential, the first stage has to be complete before revealing the next and scenarios have 3 or 4 stages. Only the active stage is revealed to players. If you complete all stages, then you've won the scenario and can play the next. You survivor will inevitably take damage as they explore the terrain, from monsters, dirty water, events or from the night terrors. Damage is tracked on a nifty tracker with 3 damage wheels and 1 stamina wheel. Damage can be either physical, poison, hunger or thirst but at the point where you need to take a 4th damage, you're done for and out of the game. You can spend resources, to recover from damage which you'll need to do very regularly. You'll encounter monsters quite regularly, you can normally avoid them if you want but they do provide relatively large numbers of resources, e.g meat and hides, so killing them is often in your best interest. The combat system is very simple, which is both a good and bad thing. You'll roll 2d12 and compare them against the numbers on the monster's card. If you beat the grey number with the grey dice you cause one damage to the monster, if you beat the red number with the red dice the monster hits you for one damage. Combat can be altered by other survivors combat support cards, if they're near enough, or by the items you've crafted. The game is driven by flipping resource tokens and investigating landmarks. Normally you'll flip a token and just reveal a resource of that type, however, sometimes you'll reveal a number which will require to draw the same number from the Exploration deck. Investigating a landmark will also require you to draw the corresponding numbered card from the Exploration deck. The 'story' is largely told through the stage cards and accessing the 'right' exploration cards. Some exploration cards have pre-requisites before you can flip them over or allow you to draw an exploration card 2 higher when resolving a token for example. This was a clever system and I thought, good design, similar to 7th Continent. After all players have used as much stamina as they want, night falls. The night phases get worse, the longer players hang around and as resources are of a nearly finite supply, eventually your survivors will succumb and lose the game. It's in your best interest to do things quickly, however, sometimes you'll find the right landmark on the very last tile, which can be hard to recover from. The art on the box and the character cards has a nice clean aesthetic which reminded me of Herge's Tintin series. The cards are simple but nice and everything is of the excellent quality that we expect from FFG. The cardboard wheels have stayed quite tight which is a good thing when you're tracking vital statistics...(nod to Underzo), you don't want them moving without intention which can be the case with similar components from other games. I would have preferred wooden meeples instead of the plastic but that is a trivial gripe. The story did not come through as much as we'd like. Often we were left wandering and wondering where to go next. The narrative felt a little loosely tacked on and only revealed by two or three sentences before you're off and trying to complete the next stage. This may be indicative on the uniqueness of each box, the designer(s) would have had a torrid time crow-barring the story into every different version of the game box. I would like to know if the story in my box is the same for all other boxes that contain the Island and Badlands terrains. The story could be better told if you were able to keep some knowledge or item bonuses from one scenario to the next. Instead, you've got a completely blank slate for each scenario making you feel like you're playing in a vacuum and your choices, or even win and lose, have no bearing on the subsequent scenario. The OCD gamer in me is worrying that maybe I don't have the best mix of components, I have to trust FFG, and I'm sure this is the case, that each game feels approximately the same and my game is neither inferior or better than all the other 'Discoverys' out there. The fifth scenario plays a little differently from the first 4 and isn't really part of the story. But what it does try to do is done far better in other games. This game really is just 4 scenarios in one base box and I'm not sure you're getting gameplay value for money with this. This game does lots of clever things that I like but a game about exploration and survival should tell a good story and this one fell a little flat for my group. I like the idea of a unique game box and the game underway looks lovely on the table. It plays in about 100 minutes, which is probably half an hour too long per scenario considering this game's complexity. I'm sure there is a very good game inside and I'm sure we will see other publishers try similar gimmicks, (a-la Keyforge) but I don't think we've reached the pinnacle of unique games design with this title. I thought the damage mechanism was good, supported by a component of excellent quality, and I liked the simplicity of the combat system if not its' randomness. 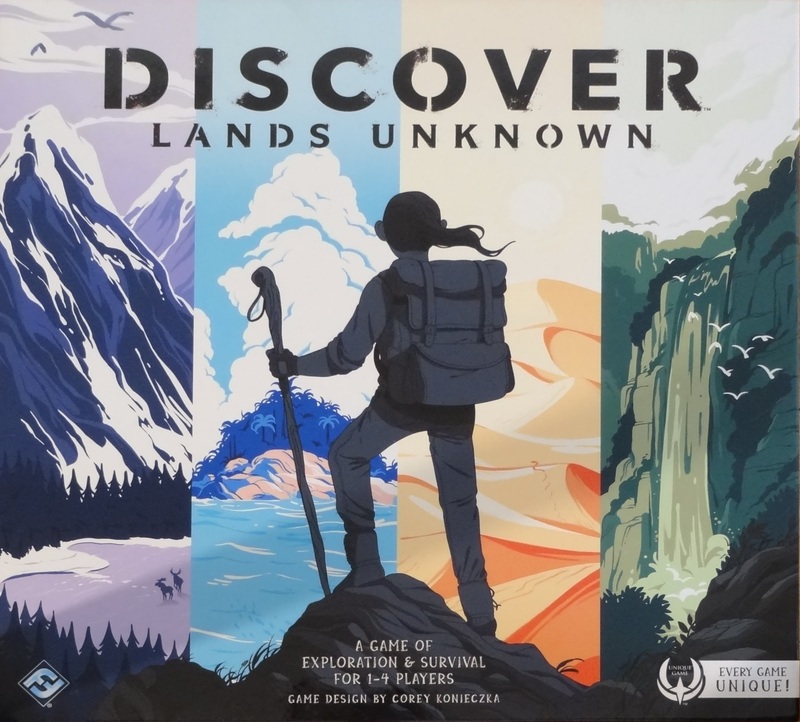 I would like to play another copy of Discover as I'm intrigued, how the designer managed to balance lots of the different elements in each game; are the stories different? do they link together in some way? etc. Some game groups, or even couples, could really enjoy the open-ended nature of this game and will re-play scenario 5 again and again, but I don't want it to be my group. Sorry FFG. This game has a huge distribution and you'll still be able to find it in almost every game store; find your nearest Friendly Local Games Store at http://www.findyourgamestore.co.uk/.